TODAY during lunch there will be an FFA Officer meeting. Come on out to the Drama Troupe’s spring play is this weekend, Friday and Saturday in the old gym at 7pm. “Charlie and the Chocolate Factory”. Get your tickets and find out from any cast member or Ms. Yeagle or purchase them at the door. TONIGHT is $5 Student ticket night! This is National Library Week! To celebrate the library will have a featured book every day. Friday's featured book is 'Famous in a Small Town'. Putt-Putt will be during lunch TODAY and the book club should meet after lunch in the library for a quick picture. This is your last chance to pay your library fines by donating non-perishable food items! See the library for more details. There will be a short summer volleyball meeting TODAY at 12:35 on Friday in the gym during lunch. Prom and Post Prom tickets will be sold in the commons during lunch Monday, April 15th thru Friday, April 26th. Prom tickets are $20 each and Post Prom tickets are $10 each. No tickets will be sold at the door. If you are not here during lunch, please see Mrs. Lagle to purchase your tickets either before or after school. Please plan on purchasing tickets with who you are walking with at Promenade AT THE SAME TIME! 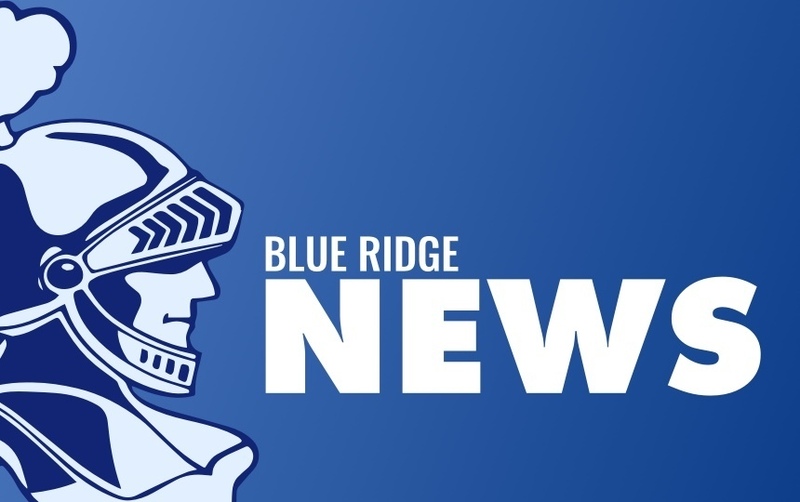 Non-Blue Ridge Guest Forms and Post Prom waivers must be signed and returned by Friday, April 26th, no exceptions! Prom T-shirt forms are available in the office or with Mrs. Lagle. There will be a Spanish Club picture on Wednesday at 9 am in the old gym for the yearbook! Seniors: The senior class trip is being planned for May 21st. Forms are in the office and due back on April 15th! The boys track team competed in the Fisher Boys invitational last night and had another solid showing. Highlights include: Tyler Maxwell placing 4th in the 800m run with a personal best 2:18.34 seconds. Dawson Raines placed 4th in the shot put. Gavin Raines won the high jump with a jump of 6-0 and won the 400 m dash with a time of 56.66 seconds. Joey Leidner placed 2nd in the 400m dash with a time of 57.60 seconds. Way to go Knights! At the 8 team Tri-Valley girls invite last night Jenna Mozingo made a clean sweep in the hurdle events, taking first in both with a time of 17.1 in the 100HH and a P.R. time of 50.59 in the 300 IH. The 4x800 team of Jessie Wanserksi, Macey Hamm, Bri Wallace and Jamie Wanserksi placed 3rd with a PR time. Macey Hamm placed 3rd in the 1600 and 4th in the 800 respectively. Polly Reynolds placed 3rd in the HJ. Carley Ester PR'd in the 300IH last night and placed 4th. Overall, good showing by the Lady Knights track team!